LLOYD'S BEWARE THE BLOG: A FAN REMEMBERS GEORGE PAL: From "Puppetoons" to "Doc Savage, Man of Bronze"
A FAN REMEMBERS GEORGE PAL: From "Puppetoons" to "Doc Savage, Man of Bronze"
"BUT WHEN WORLDS COLLIDE, SAID GEORGE PAL TO HIS BRIDE, I'M GONNA GIVE YOU SOME TERRIBLE THRILLS"
I’m sure there are many people familiar with “The Rocky Horror Picture Show” and the opening song “Science Fiction Double Feature.” containing the above refrain. However, some of the fans of that film and play may not have a clue as to the significance of that name, or what that comment about “When Worlds Collide” might actually mean. He made 14 feature length films and half of them were Oscar Winners. Mostly for the quality of the Special Effects used at the time. 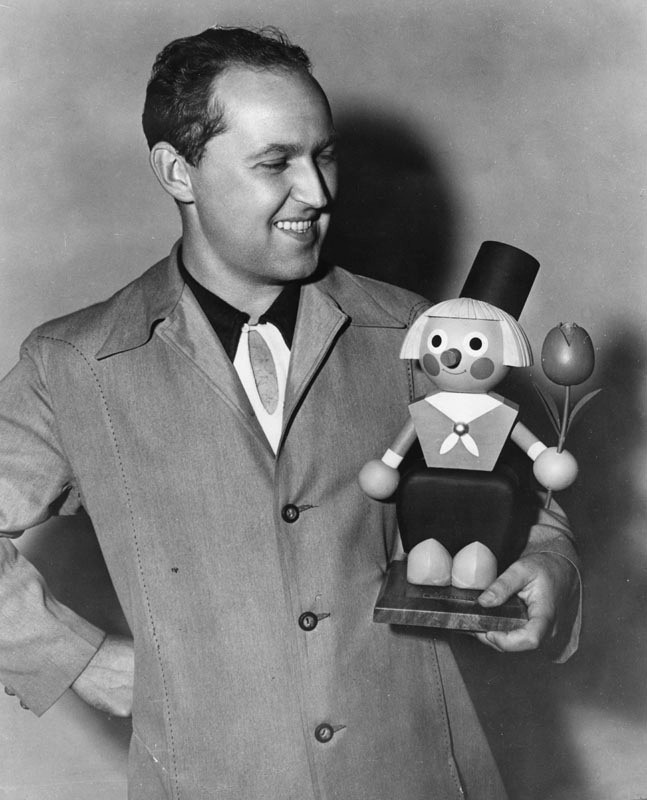 He was born Gyorgy Pal Marczincsak on February 1, 1908 in Cegled, Hungary, but song writer/actor/fellow film buff Richard O’Brien and I knew him as George Pal. Over his career he would be credited with being a cinematographer 22 times on his "Puppetons", a producer of both his "Puppetoons" and feature length motion pictures 41 times, a director in both mediums 60 times, film editor 5 times and an actor twice including playing a bum in a street scene in his 1953's "War of the Worlds". The above photo was taken on November 27, 1946, or one month and eleven days after my birth. 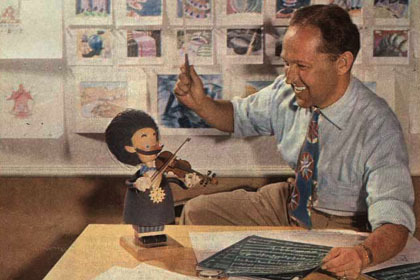 In George Pal's hand was one of his "Puppetoon" characters. While Walt Disney, Max Fleischer and others were bringing animated drawings, cells, to life as cartoons. Pal starting in 1930's Europe used stop motion hand carved wooden puppets with multiple heads, arms and legs. I first met the work of this imaginative film maker while sitting in the backseat of my parent’s car wearing pajama’s at the tender old age of three and a half. The setting was some forgotten Los Angeles area Drive-In Theater. The typical 50’s type with a play area with swing sets and a sand box to give your father the fun later of cleaning off the back seat and floor of his car. A concession stand pushing Hot Dogs, Candy, Popcorn and something called Pizza. It was at these theaters that the Pizza craze took hold outside of the Italian community. Then there were those prize drawings between the double feature. Where with the ticket given out with the car’s admission. You might win a toaster or the much hope fore place setting of Melmac dishes, a colorful form of plastic, very popular at the time. Eat your heart out Alf! An of course there where those speakers you had to place upon the driver’s side window to hear the movie and pray when the film started they actually worked, or Dad had to move the car to another maybe less choice spot. 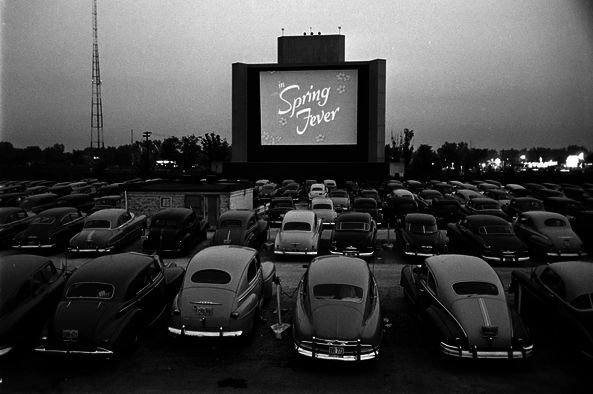 Below a 1951 Drive-In theater about to show a Paul Terry Cartoon entitled "Spring Fever". My first George Pal motion picture was “Destination Moon” and although I would not know it for many decades. The story and screenplay were co-written by author Robert A. Heinlein. Who would later adopt that 1950 screenplay into a novella of the same name. The picture was 100 percent scientifically accurate for the year it was released and was praised by Scientific magazines. The accuracy was reflected in the detail of how a space craft, at the time believed to be a single stage, would need to be constructed to make such a flight to our nearest neighbor and how that same flight would work. Heinlein’s influence had the space craft being built not by the military, but private business a reflection of his political views. Ex-German Rocket Scientist, he fled Germany in late 1930's, Willy Otto Oskar Ley did the technical work. The one part of "Destination Moon" that always remained in three and a half year old Lloyd's mind was the "Woody Woodpecker" cartoon from Walter Lantz's studio. It was used to explain Space Flight. and was actually very informative for the time. Following Willy Ley's scientific writings and thought. 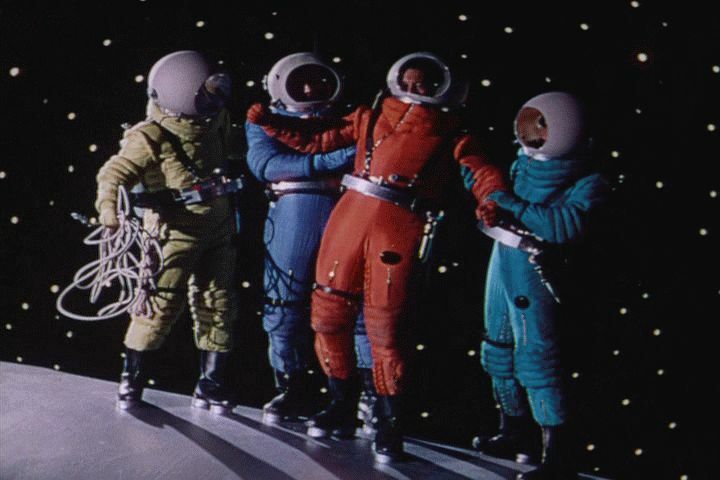 George Pal's screenwriters Robert A. Heinlein, James O. Hanlon and Alford "Rip" Van Ronkel showed the effects of G-Force on the crew and the need for spacesuits. The colorful suits was designed as such for two reasons. One to identify each crew member for the audience, but also to be easily seen in space. 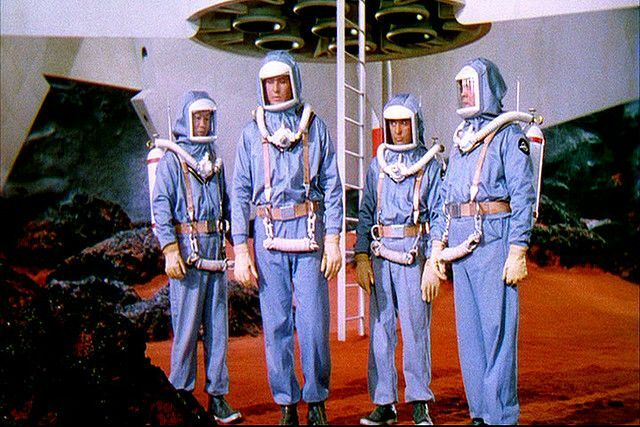 Those suits would be reused in several early 1950's science fiction motion pictures such as the following years "Flight to Mars". Where the Martians wore them. 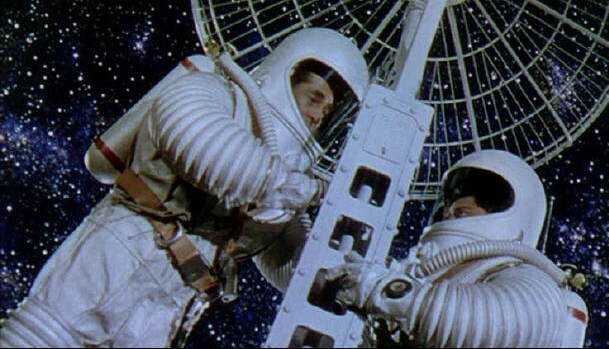 "Destination Moon" won George Pal the first of those seven feature film Academy Awards, It was nominated for two "Visual Effects" and "Art Direction" and won for the first. Pal's production inspired Neil Armstrong, among others, to become an Astronaut. The only major scientific mistake for 1950 was the design of the Moon landscape. It was scientifically believed that the Moon might be full of craters. Instead of basically flat and sandy as Armstrong, himself, would discover on July 21, 1969 taking that “one small step for (a) man---" . 1951 found George Pal turning Philip Gordon Wylie and Edwin Balmer’s 1933 end of the world novel “When Worlds Collide” into his second Oscar winning feature. So now you have the source behind Richard O’Brien’s refrain about George Pal's "Terrible Thrills" in “Science Fiction Double Feature”. "When Worlds Collide" tells of the discovery of two new planets heading toward Earth. The first "Bellus" will pass close to the planet causing massive Earthquakes, Tidal Waves and Volcanic Eruptions. The second "Zyra" will hit the Earth directly and destroy it. Mankind is given eight months to live. Some members of the United Nations science community say it won't happen, others say "Bellus" and "Zyra" will come close, but there will be no collision. The film watches as a group of scientists and technicians race the clock to build "Arks". The purpose of these space craft, at sites around the Earth, is to save as many people from annihilation as possible by flying them to "Zyra". After it takes the same orbit of the Earth. 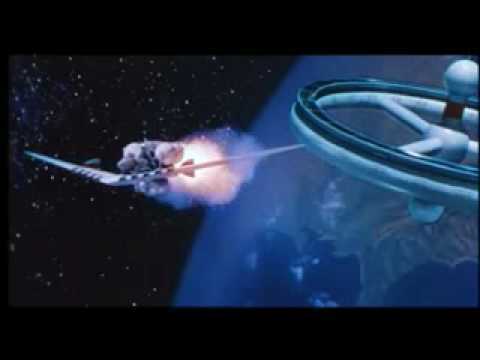 One of the means of building tension as the 83 minute motion picture progressed was to show a daily count down to each of the two on coming planets. In the below shot "Zyra" had reached the Earth and the destruction starts. 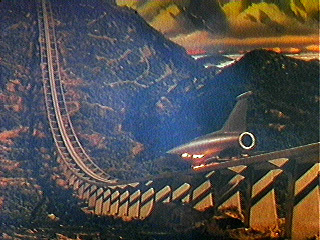 Five year old Lloyd was amazed at the special effects as where adults who saw the film with it's tight story line. 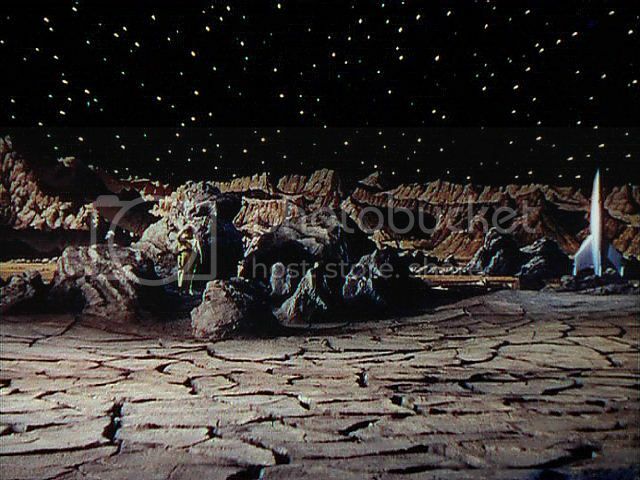 Although very dated by today's standards are the use of matte shots in "When Worlds Collide". 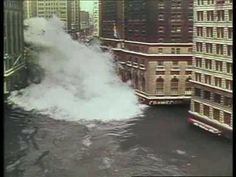 One of his second Special Effects Oscar sequences enthralled audiences as we saw for the first time New York City destroyed as the Atlantic Ocean turned into a giant tidal wave. One of those matte shots is of the after effects. At the time impressive, but today it seems so crude due to budget constraints on producer George Pal. Even tough the non on screen credited "Executive Producer" was Cecil B. DeMille. My favorite scene in Pal’s “When Worlds Collide”. 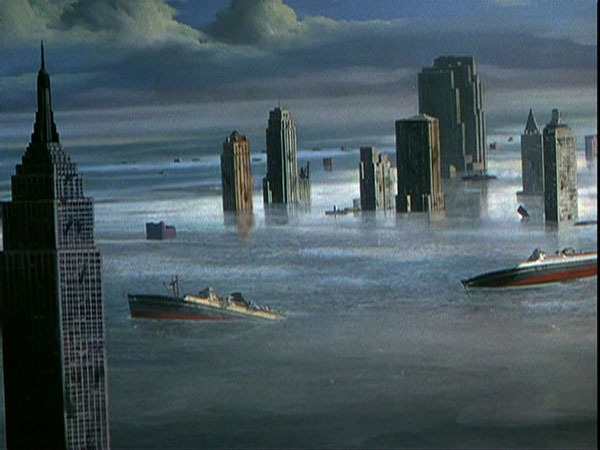 Outside of those New York skyscrapers under water in that famous, or infamous, depending on your point of view today, matte shot above. Occurs when actor Richard Derr being one of the few people who knows our world is about to end. Will shock wealthy diners at an adjoining New York night club table by lighting his cigarette with a $100 bill. Today that action would equate to the shock value of using a $1,000 bill. 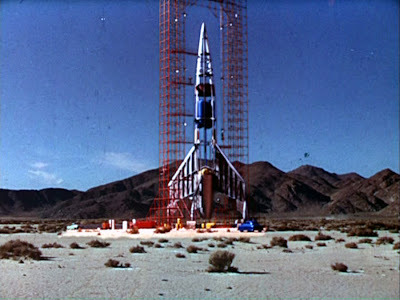 Unlike the single stage rocket in "Destination Moon". Which was a staple of 1950's science fiction movies and television shows. A more cinematic version was used in the plot of 'When Worlds Collide". Due to the expected weight of each "Ark" with its payload of people, animals, food and building equipment. The space crafts are built on a railway system to assist in obtaining escape velocity and offset the amount of fuel needed during take off. Below the special effects crew works on the "Ark" seen in the motion picture. Scenes of the "Ark's" construction and launch as I saw it on the big screen in November 1951. For 1950's science fiction buffs. 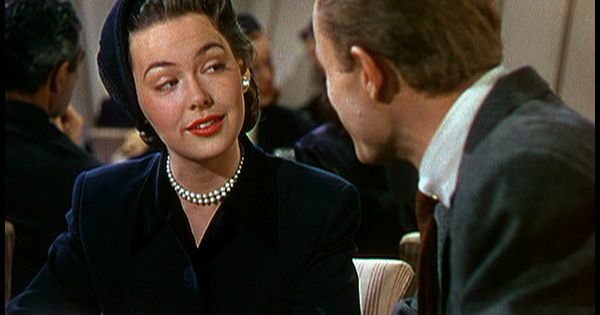 "When Worlds Collide" was the fourth motion picture with actress Barbara Rush. Three films later she made the classic 3-D picture "It Came from Outer Space". Below Rush and Richard Derr just before he lights that $100 bill. Footnote: George Pal wanted to film the novels sequel “After Worlds Collide” in 1955, but Paramount Pictures would not back his venture as a result of the box office failure of “The Conquest of Space” I will speak too that picture shortly. On July 2, 1953 George Pal's production of "Houdini" was released. 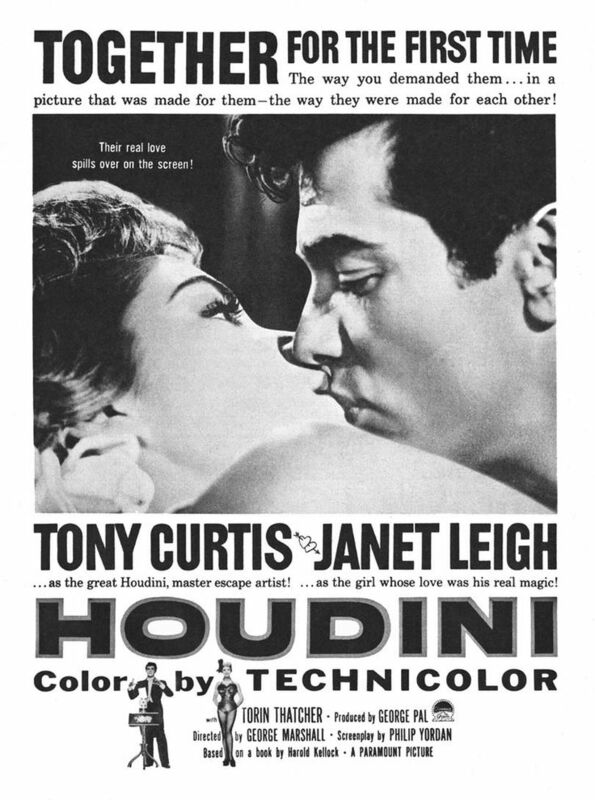 The film starred the recently married husband and wife team of Tony Curtis and Janet Lee to draw in the audiences. As this fictional biography of the escape artist, magician and illusionist is glossy routine entertainment and was based on a 1928 novel, not a researched biography, by Harold Kellock. I admit that as a young six year old boy having enjoyed the film also seen from my parent's car's backseat. After two years of development and filming. 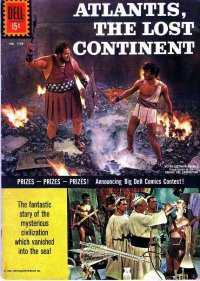 1953 saw the release of probably the most widely known of Pal’s films. His adaptation of H.G. 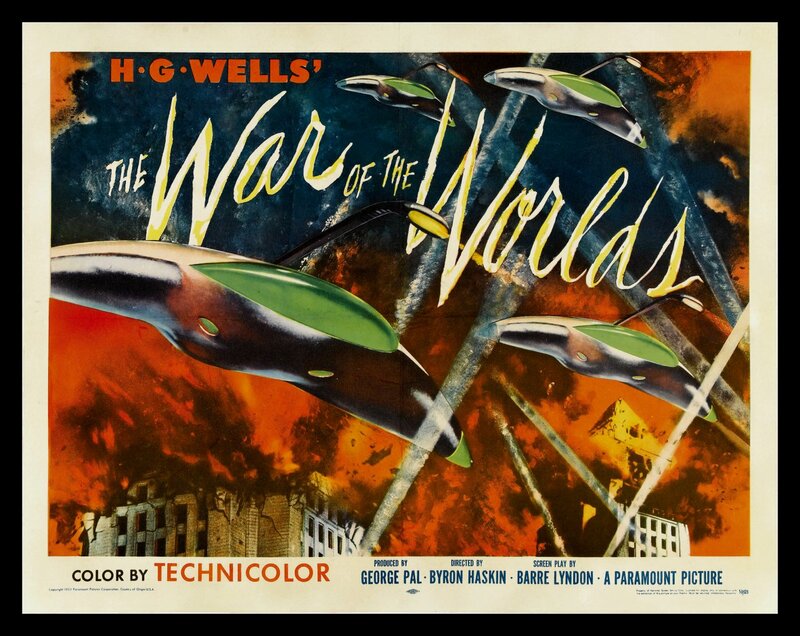 Wells’ “The War of the Worlds” giving George Pal his third, Academy Award for Special Effects and his Audience some more of those “terrible thrills”. 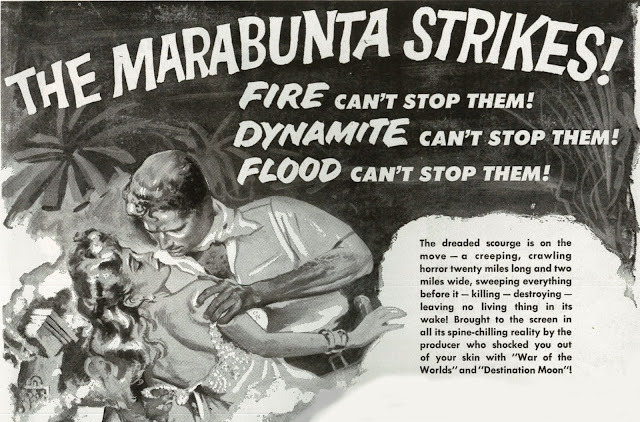 The timing of this picture's release, on August 26, 1953, from a strictly political point of view couldn't have been any better and did contribute to the film's viewership. What I didn't know, or would have understood when I first saw the picture. Was that release date had been only one day less than a full month from July 27, 1953. The day the cease fire ended the "United Nations Korean Police Action" aka: "The Korean War", America had been fighting both the Chinese and Russian Communists since June 25, 1950 with a Cold War fear of our country being overrun. In 1952 Columbia Pictures had released "Invasion U.S.A." speculating on what a Russian take-over of America would be like that year. 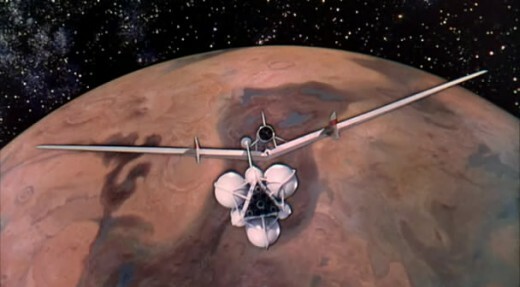 George Pal's production played to my parents Cold War fears by substituting the Martians for the Communists. The prologue of the picture, as explained by narrator Sir Cedric Hardwicke, contained a history of the first two World Wars, but specifically leaves out Korea. On hindsight leaving Korea out of the narrative by screenwriter Barre Lyndon was part of the substitution his dialogue played upon. While I sat with my parents at the La Brea Theater in Los Angeles. I sat transfixed with the audience as we watched Los Angeles being famously destroyed by the Martian War Machines. As buildings that even at the age of 6 and locations I knew were blown to bits by the invaders. 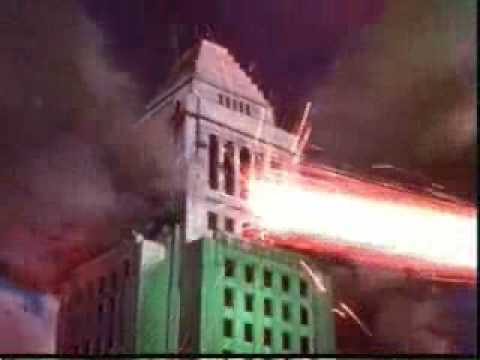 I admit to remembering having a few nightmares and wanting my parents to take me downtown to verify the city hall was still there. Those Martian War Machine's remained completely realistic and great looking until I got my first Re-mastered DVD. I never saw the wires holding them up in all my viewing over the years, but thanks to the downside of technology I now did. 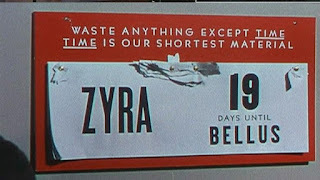 The film inadvertently contains an historical preservation never dreamed of in 1953 pertaining to Southern California. 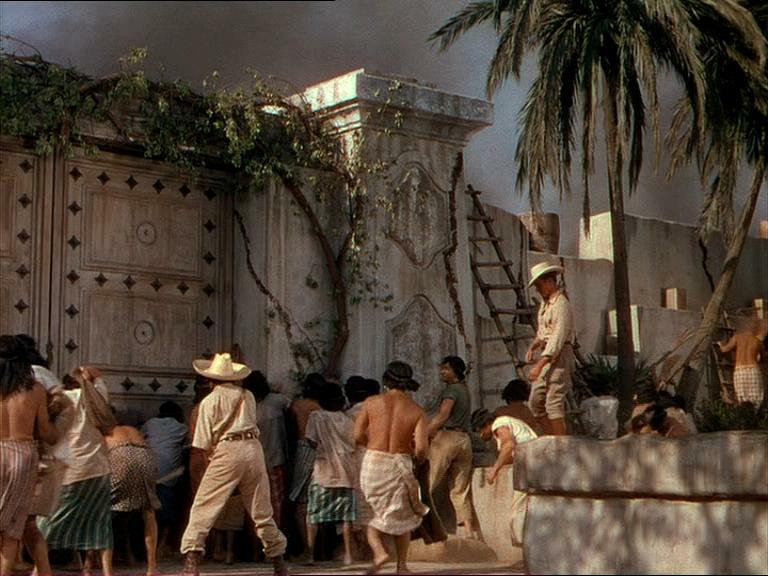 In the fictional rural community of "Linda Rosa" people come out of the movie theater showing Cecil B. DeMille’s “Samson and Delilah”. DeMille was also Executive Producer on this picture again without on screen credit. The people coming out of the theater's dialogue notes that the first Martian meteor (cylinder) appeared to land somewhere in the forest near the real community of Pomona in rural Los Angeles County. In a follow up scene we find a group of scientists fishing at a rustic lake not far from Pomona. This leads to Gene Barry as "Dr. Clayton Forester" meeting Ann Robinson as "Sylvia van Buren". Filmed partly on location and partly on a set, below. 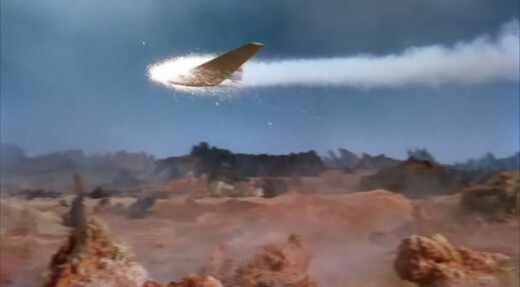 Later in the film is the scene of a small plane supposedly carrying actors Gene Barry and Ann Robinson flying over a hilly area with rich grassland identified as Corona. In 1953 a rural community in Riverside County. The real community of Corona was also used for the town of "Linda Rosa". 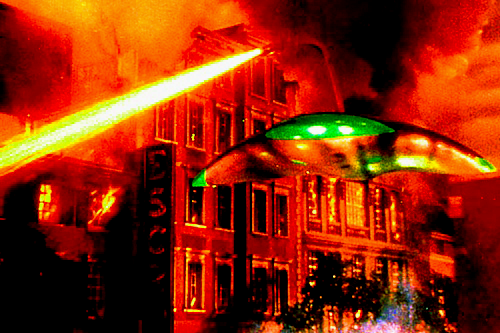 "War of the Worlds" and today. The driving distance between the city hall of downtown Los Angeles and the city hall of Corona is approximately 63 miles. Add to that the distance from downtown Los Angeles to my home, also within Los Angeles County, of another 22 miles further. Making the total distance from my front door to the plane scene in Pal’s “War of the World’s” as approximately 85 miles. Today you will not see one beautiful piece of scenery as in those four scenes I described. Everything now is wall to wall houses, apartments, businesses, streets and freeways. Without the city identification signs you would have no idea if you’re driving through one large continuous city, or all the small one's that make up that 85 miles. Therefore by watching this movie the viewer is looking at a preserved piece of the history of the original rural counties of Los Angeles and Riverside. Another aspect to those old movies you may never have thought about. 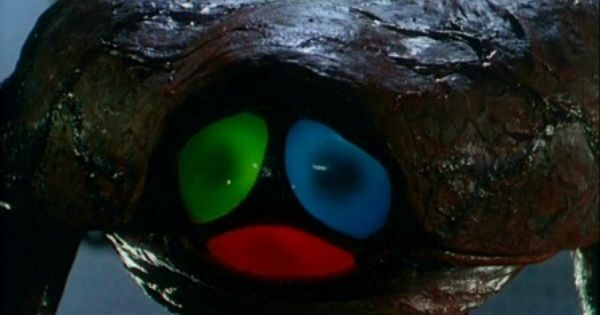 Originally the film did not intend to show the Martians themselves. Pal decided otherwise and legend has it that the creature that scares the hell out of Ann Robinson in the deserted Corona Farm House was basically put together on a technician’s lunch hour. 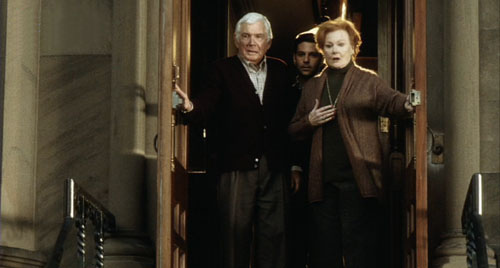 Yes playing Tom Cruise's father-in-law and mother-in-law at the end of Steven Spielberg's 2005 'War of the Worlds"in cameo's were Ann Robinson and Gene Barry. My youthful interest was kept at it's peak in 1954. 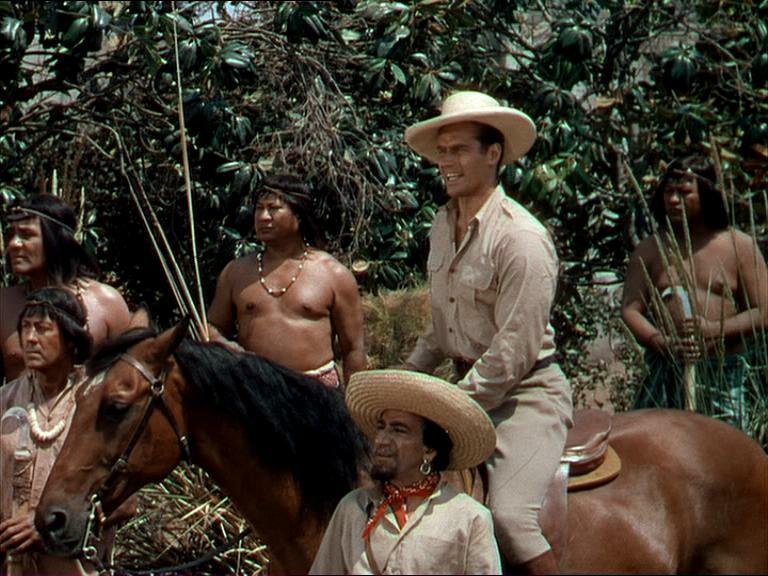 When George Pal turned Carl Stephenson’s 1938 short story “Leiningen Versus the Ants” into “The Naked Jungle” starring a Paramount Picture’s Contract Player named Charlton Heston. 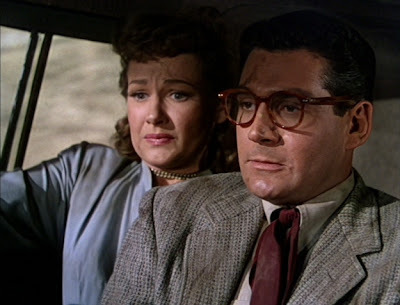 His co-star was Eleanor Parker. The movie was directed by Byron Haskin who had directed "War of the Worlds". Was a great tag line as the potential audience found that these were "Soldier Ants" aka: "Legendary Ants" aka: "Marabunta". According to the story the ant's swarm, fictionally, every 27 years and destroy anything including humans that get in the way of their march. 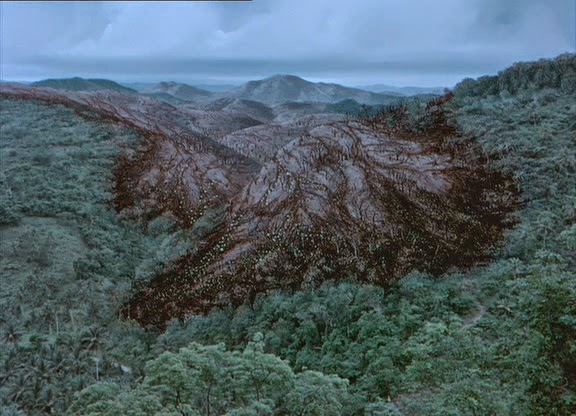 The movie is set in 1901 South America and it has been 27 years since the last swarm. 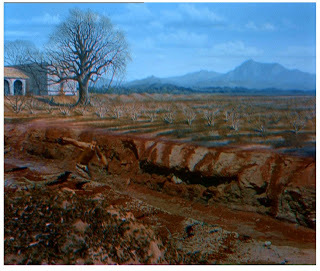 Even the long distance animated scenes of the “Marabunta” coming over the hill tops and turning the green growth to naked dirt works in the film interspersed with shots of real ants. The added love story line revolves around "Leiningen's" rejection of the “widowed” mail order bride his brother arranged for him to marry, because "Leiningen" like everything in his South American Cocoa Plantation's Main House is "new" and "untouched". This, for 1954, odd love story works well to build up the tension for the final battle of wills between Heston and the “Marabunta.” As we follow the discovery of the ants and the fact his plantation is directly in the line of march. The climax comes with the attack on the plantation proper and eventually "Leiningen's" compound and house. Below the man operating the dam makes the mistake of falling asleep. 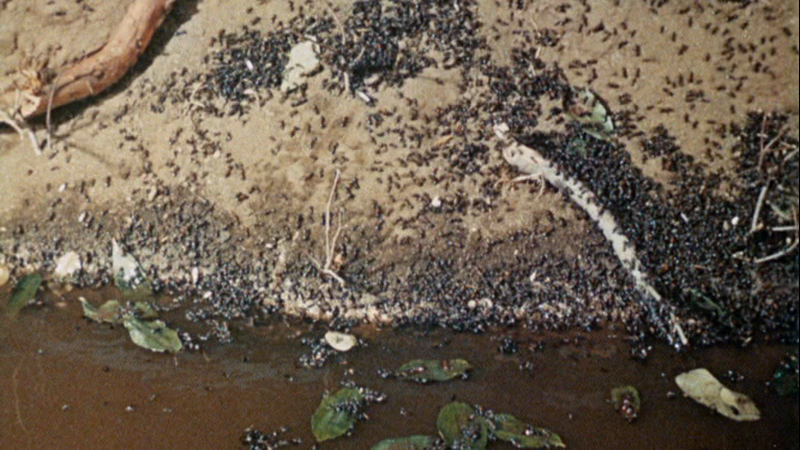 As the ants approach the compound is secured as best as possible and is surrounded by oil in a plan to stop them.Heston will have to cover himself with oil and work his way through the ants to the dam and flood his land. Below a shot of the plantation after the dam flooded it. "The Naked Jungle" is well worth a look, if you haven’t seen it. Technically this movie based upon a non-fiction work, of the same name, by Rocket Scientist Willy Ley was a visual success. Story wise the movie stunk. 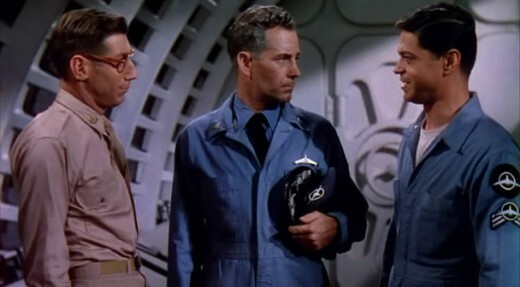 The plot centered not on the films title, but the conflict between "General Merritt", Walter Brooke, his son "Captain Barney Merritt", Eric Fleming, and Sgt Mahoney, Mickey Shaughnessy. The Sergeant idolizes the father and can’t understand why the son doesn’t. An old hackneyed plot which was overused in variations in both War and Western movies of the period and earlier. Otherwise the plot is about the supposed first flight to the Moon as political cover for the first flight to Mars. On a plus side for this space adventure was the International feel to the cast of Space Explorers. The characters include actor Benson Fong as "Sgt. Moto", Ross Martin as "Sgt. Andre Fodor", Vitto Scotti as "Sanella" and John Dennis as "Donkersgoed". 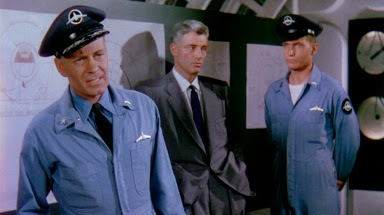 Also in the cast was William Hopper as "Dr. George Fenton"
Looking at the technical aspects of the motion picture. The audience familiar with Pal's "Destination Moon" noted a change in the designs of the space suits. In the five years since the other film scientists had thought two different types of suits would now be required for space travel. One for operating in deep space outside the ship and another lighter design for movement on the surface of a planet. Above the accurate for 1955 deep space suit and below the lighter exploration version. Of interest to the true Science Fiction Fan are the models used for the “Space Wheel” and the “Mars Rocket”. Both of which followed closely Willy Ley and Wernher von Braun's conceptional designs. 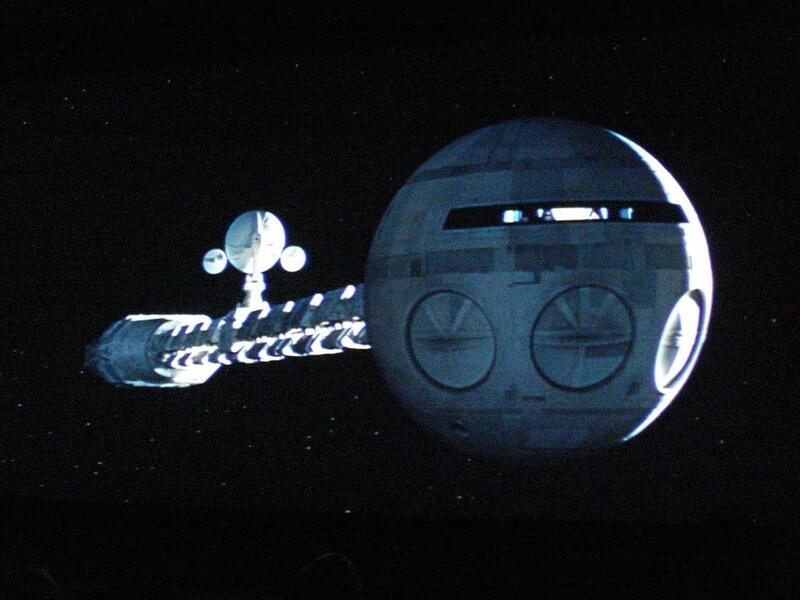 In fact thirteen years later in 1968 when Stanley Kubrick made his classic “2001: A Space Odyssey”. The only fundamental change from the facts known by Pal in 1955 and those known by Kubrick in 1968 for deep space travel was one item FOOD. In 1955 scientists thought space travelers would be required to eat pills instead of solids and in 1968 they now thought space food would be basically synthetics that tasted like the real thing. Otherwise it was still believed that a Space Station should be designed as a wheel. 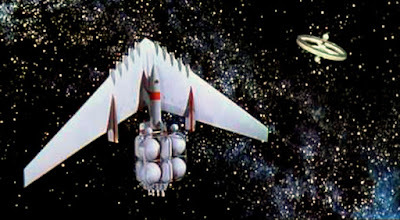 Although the designs are slightly different in the two deep space crafts. Both craft designs contain a major command module with a power plant attached. 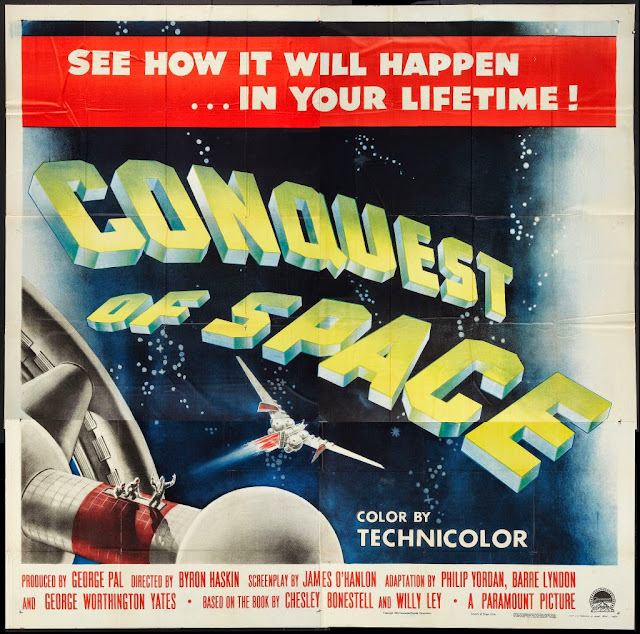 As I implied above "Conquest of Space" had a sluggish plot that ruined the film. At one point "Barney's" father starts to think that "God" is against man going into space. This mental breakdown begins after the Russian born "Sgt. Fodo" is killed by a meteorite and the "General" believes his death was a sign from "God". He first attempts to crash the space craft into the Martian surface, but "Barney" wrestles the controls from him and lands safely. Later when his father attempts to sabotage the craft to prevent the crew from ever taking off again. There is a fight between father and son that results in the "General's" death. He had a hand gun and in the struggle it went off. The idolizing "Sgt. Mahoney" only sees the end of the struggle and believes "Barney" deliberately murdered his father. As a result the Sergeant\ wants to charge him with murder and present "Barney" to a court-marshal. Of course "Sgt, Mahoney" will have his mind changed by the end of the picture. As I said you've seen this before. To be fair to Pal perhaps the adult viewing audience wasn't into space pictures in 1955. The major money makers were five war films: "Mister Roberts" starring James Cagney and Henry Fonda, "Battle Cry" with a screen play by the novels author Leon Uris, "Strategic Air Command" from Paramount Pictures starring James Stewart and June Allison, "To Hell and Back" starring WW2 hero Audie Murphy as himself and "The Sea Chase" starring John Wayne and Lana Turner. Add to those two major musical releases Rodgers and Hammerstein's "Oklahoma" in Todd A-O and "Guys and Dolls" starring Frank Sinatra, Marlon Brando and Jean Simmons. Along with Glenn Ford, Anne Francis and Sidney Poitier in the high school shocker of the day the "Blackboard Jungle" and Walt Disney releasing his first CinemaScope animated feature "Lady and the Tramp". An it is easy to see "Conquest of Space" would have had a hard time finding an audience. Also on the same science fiction front you had the release of the first sequel to "The Creature from the Black Lagoon" entitled "Revenge of the Creature", "Tarantula", "It Came from Beneath the Sea" from Ray Harryhausen, and Roger Corman's "The Day the World Ended". The only other true Space adventure was "This Island Earth" which was a major money maker for Universal Studios and had that classic Metaluna Mutated Insect and Faith Domerque a eight year old boys dream. As mentioned because of the box office failure of "Conquest of Space" Paramount Pictures refused to finance Pal’s “After Worlds Collide”. So, George Pal said good-bye to the United States and moved his production company to MGM’s British Studios. The move's first result was an Oscar once more in the category of Special Effects for 1958's “Tom Thumb”. 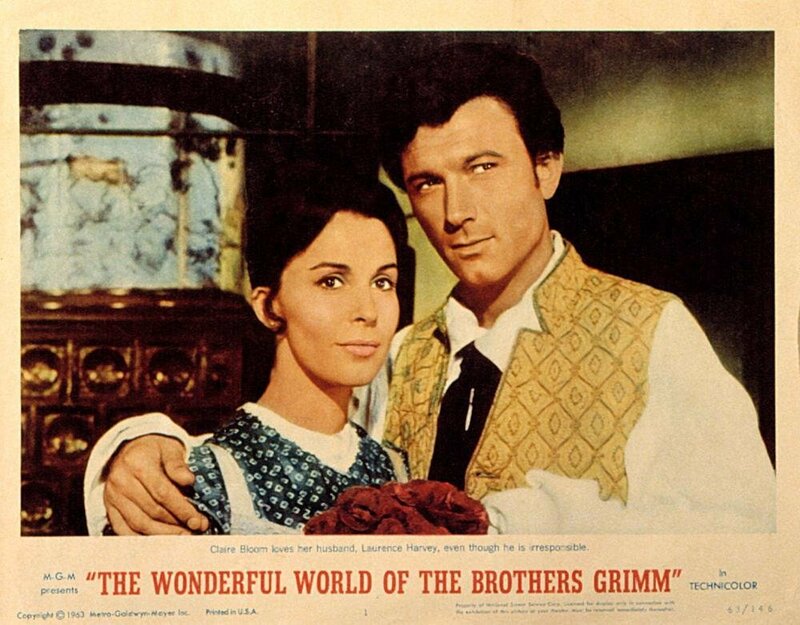 A musical adaptation of the story by the Brothers Grimm starring Russ Tamblyn as the boy no larger than a thumb. 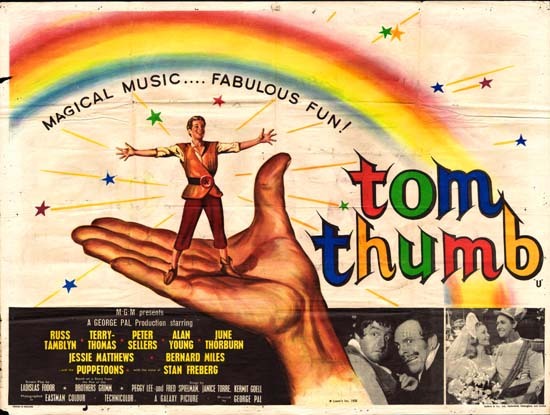 "Tom Thumb" featured two British comedians mostly unknown in the United States in 1958. They were Terry-Thomas and Peter Sellers as the inapt villains. For those, like myself, who were into British comedy. Sellers had a part in the Alec Guinness starring movie 1955's "The Ladykillers", but I had to see it at an Art House Theater in Santa Monica. As the movie was extremely limited in release in the United States. 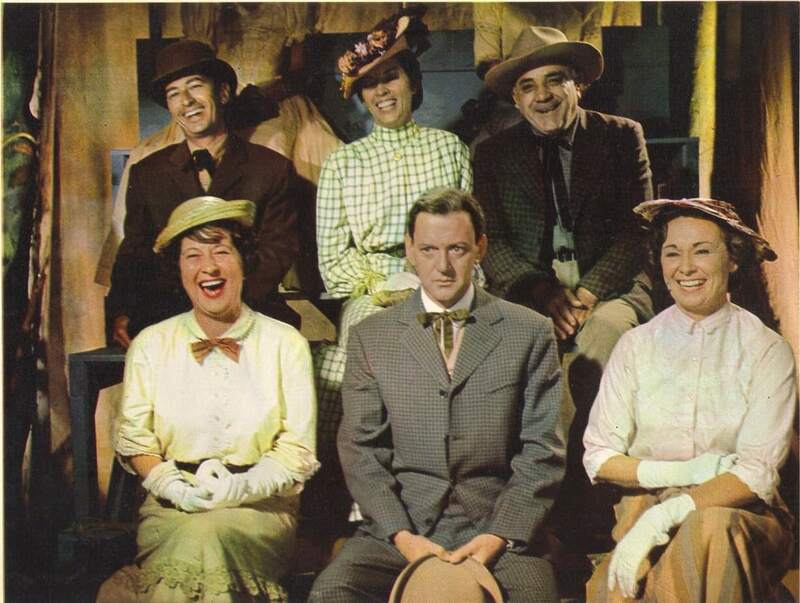 Portraying "Tom's" friend "Woody" was actor Alan Young. Who is in love with the "Forest Queen" played by June Thornburn. Also appearing in some of the musical numbers are George Pal’s Oscar winning, every year from 1942 through 1948, “Puppetoon” characters. 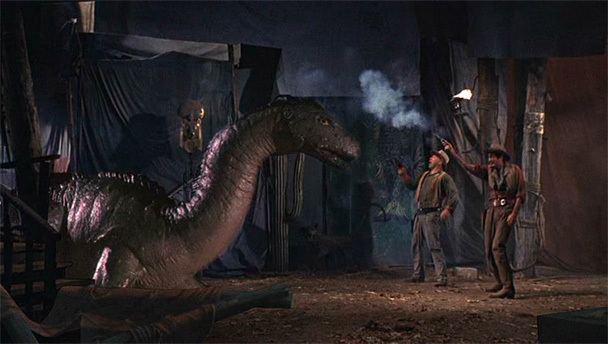 Which for 1947 and 1948 an ex-Army Serviceman named Ray Harryhausen worked upon. I recommend Ray’s excellent work: “A Century of Stop Motion Animation” for his views on George Pal and Willis O'Brien. 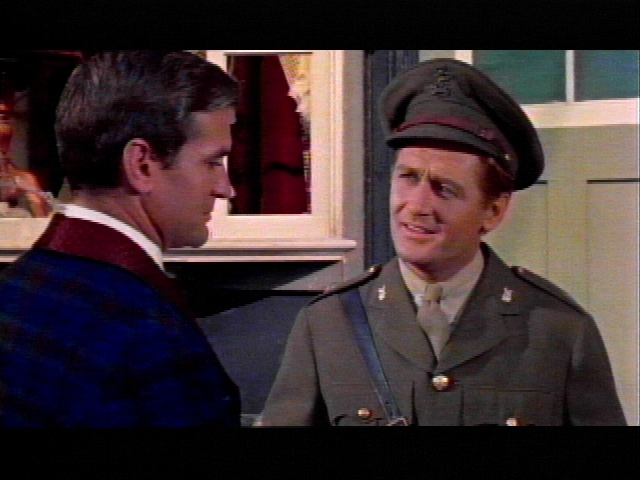 Rod Taylor's Time Traveler character was always referred too by the name of "George" in the motion picture. You never heard any mention of his last name and presumed "George" was his first name, but on the script and in the film's credits his full name was "H. George Wells". Pal used two gimmicks to advance the story in this very enjoyable film. The first has a dress shop opposite a window that George can look at from his home as he travels further into the future. The gimmick was nothing less than the dresses on a female mannequin changing while this Victorian Gentleman comments on women’s styles through the years. The second involved actor Alan Young who had the dual role of David Filby and his son James. David is the narrator of the story book ending it within the opening and closing scenes. The character of James appears first on leave during World War One. In that scene James informs George that his father has died, but left funds and instructions not to touch George’s house adding that he seemed to think the man who lived there, an inventor of some kind, would someday return. The next time George meets James it is August 19, 1966. That is six years to the day after the film was actually released. The old James is trying to figure out where he has seen the still Victorian looking George, but just than the air is filled with the sounds of sirens going off and he tells George to get into a bomb shelter. In the next few seconds an Atomic Holocaust wipes out the human race, almost. George just manages to escape death by entering his time machine and next stops on October 12, 802,701. 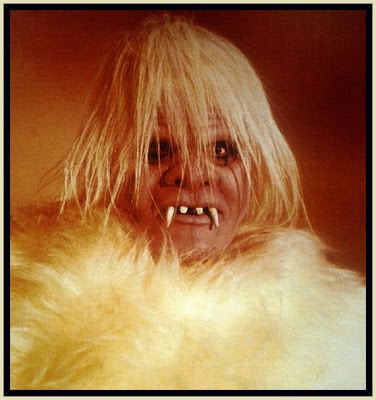 Which begins the second half of the film in a future world of childish “Eloi” and the cannibalistic “Morlocks”. The two versions of humanity that survived that 1966 nuclear holocaust. In this future world George meets and falls in love with the beautiful "Weena" played by newcomer Yvette Mimieux. George also discovered that the innocent "Eloi" are the cattle of the "Morlocks". Along with a lot of other 14 year old's I really enjoyed this film and to show how much MGM agreed with us. 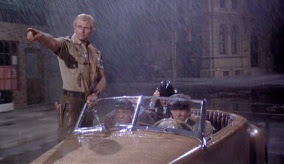 The production’s budget was $829,000 dollars and grossed $2.61 million dollars at the 1960 box office. For comparison to 2017 as I write this article. The adult admission price for a movie theater in the United States in 1961 averaged 69 cents and remember we saw double features back then. Although cheesy, with terrible rubber monster maaks, stock footage from films such as "Quo Vadis" and Pal's own "Naked Jungle". Not to mention props from "Forbidden Planet" such as the "Krell" instrument gauges and a giant statue from a 1955 forgotten Lana Turna "Biblical Epic" "The Prodigal". 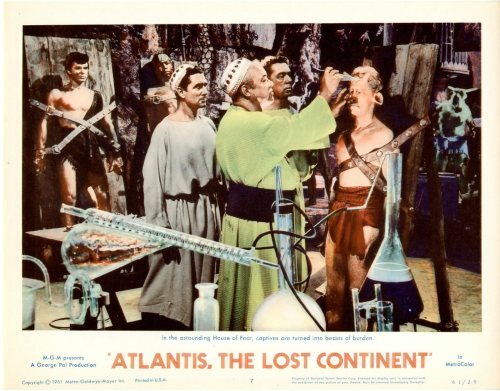 1961 still found 14 year old Lloyd Fradkin, being used to low budget science fiction, having a good time with the hokum of "Atlantis the Lost Continent". The movie starred Anthony Hall actually an Italian actor by the name of Sal Ponti playing a Greek Fisherman named "Demetrios". Ponti, or Hall's English language voices was dubbed. At one time William Shatner and Richard Chamberlain were considered for the role. Out fishing with his Uncle the two men discover Joyce Taylor, co-starred in 1960 TV series "Men Into Space" & AIP's "Twice Told Tales", floating on what is left of her ship. Of course she turns out to be an Atlantean Princess named "Antillia" and eventually convinces him to take her home. Not to put down all the effects in this movie. 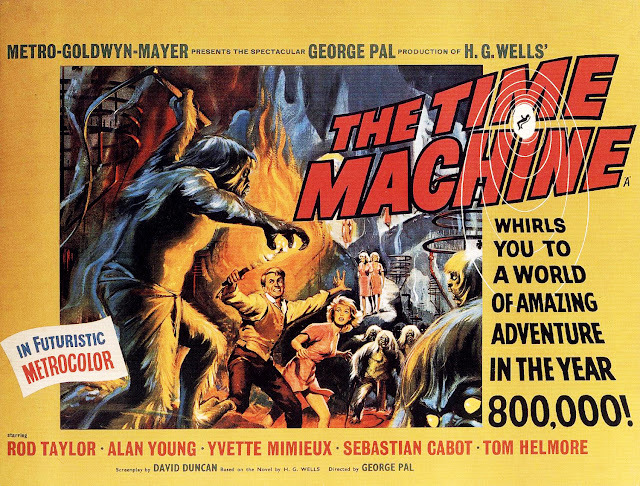 The effects team was headed by Gene Warren, who won the Oscar for "The Time Machine", Wah Chang who built the time machine and would design the props for most of the original "Star Trek" series and Jim Danforth. Who was working at the time for Warren and Chang's "Projects Unlimited". 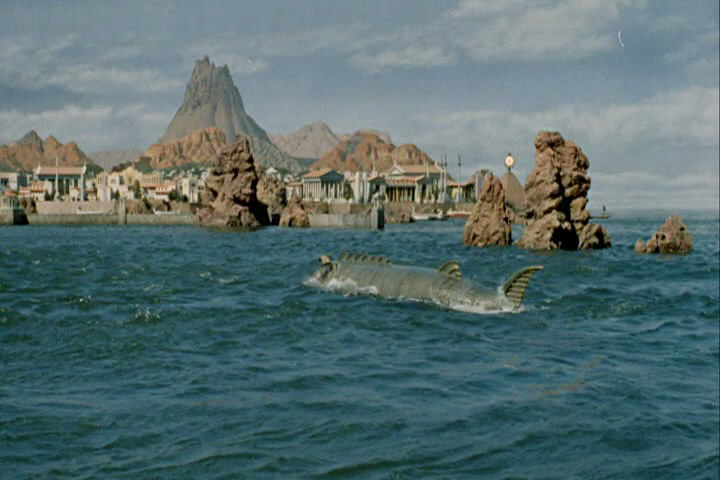 One of their creations was the Atlantean submarine. Which I wished then, and still do, had more screen time. The submarine crew rescue the Princess and "Demetrios" and returns to Atlantis. There instead of being rewarded. 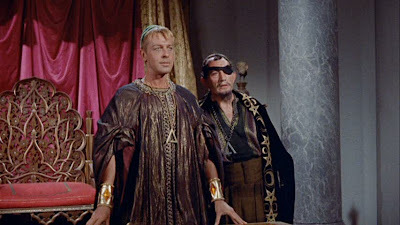 "Demetrois" is made a slave and has to deal with an usurper, John Dall known for Alfred Hitchcock's "Rope" and an evil sorcerer, Frank DeKova, "Chief Wild Eagle" on TV's "F-Troop" and many great bad guys. Seen below is Lana Turner in a publicity still with the giant statue from 1955's "The Prodigal". 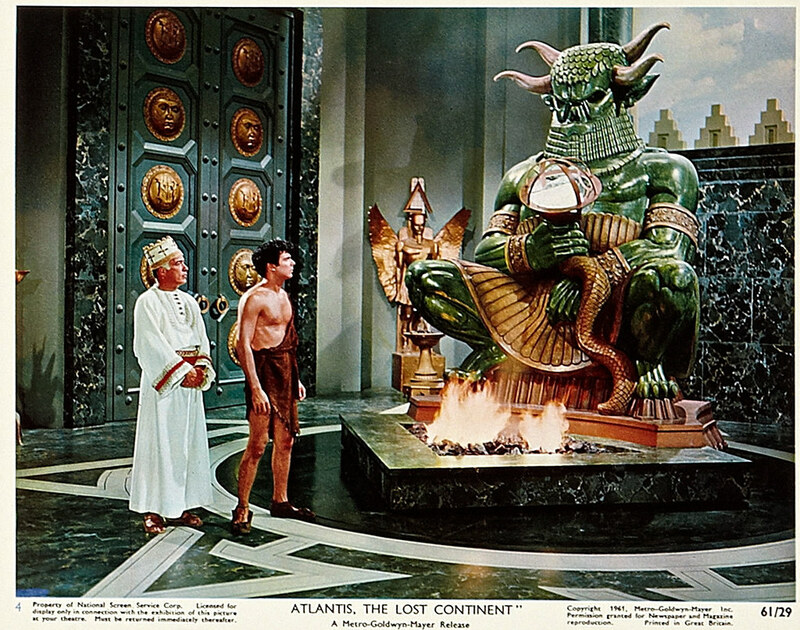 The same statue in "Atlantis the Lost Continent" as their "God". Azor, the priest portrayed by the future "Chief" on television's "Get Smart", Edward Platt, tells "Demetrois" of his belief is one true "God". The Giant Crystal Weapon that was suppose to help Atlantis rule the world. Goes out of control as the volcano erupts and kills the usurper. 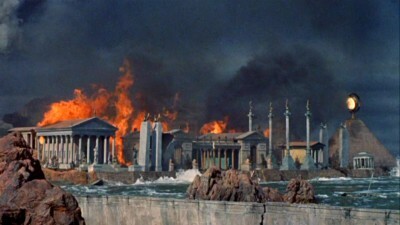 Some of the shots of the destruction of Atlantis that were also interwoven with stock footage of a burning Rome from the movie "Quo Vadis". To explain why movie critics considered this the worst motion picture George Pal ever made. Which adds prestige to "Conquest of Space". David Wingrove in his 1985 "Science Fiction Film Source Book" referenced a reply from a preview audience viewer to the question: "What was your favorite scene?" The answer refers to the sequence where "Demetrois" saves "Antillia" from the above destruction. 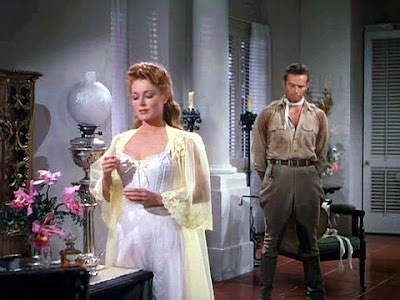 The audience members answer as written was: "The scene where Robert Taylor saved Deborah Kerr from the fire". 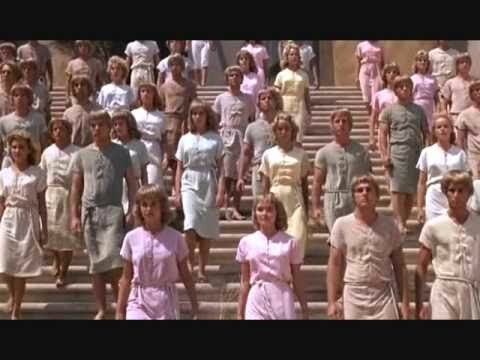 Actually some of that stock footage from the 1951 MGM movie "Qua Vadis" in which you clearly see Taylor and Kerr not Sal Ponti and Joyce Taylor, no relation to Robert. 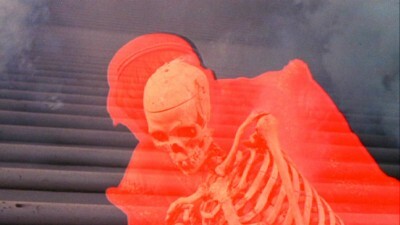 The film had a direct effect upon my future as I decided I wanted to become an Archaeologist and find missing cities. Even wrote a High School history paper on the subject which turned into one on proving the Biblical Flood actually happened. Unfortunately for my plans the Vietnam War came about, but even that had its good points in a roundabout way. I was assigned to the aircraft carrier USS Shangri-la CVA-38 and spent my four years in the Mediterranean Sea visiting Greece, stationed for a while in Italy and other ancient countries and cities. I never went back to school for Archaeology. I did, however, recently purchase for $2.50 a copy of the 15 cent Dell Movie Comic I once owned. In 1962 Pal teamed up with Cinerama Productions, the process created by Merian C. Cooper of "King Kong" fame, see link below, for a look at the incredible life of Cooper. The motion picture was shot in the three strip Cinerama process created by Cooper. This required three cameras to film the motion picture and three projectors, at special venues, to show the picture. The screen covered the normal range of a person's eyesight and in many sequences your brain reacts as if it was actually looking at a live scene. The downside were the two lines to match the three projectors on the giant screen. As the above poster indicates for the time George Pal put together an all star cast to tell the story of "Wilhelm", Lawrence Harvey, and "Jacob", Karl Boehm, Grimm. Actress Claire Bloom portrayed the dreamer "Wilhelm's" wife "Dorothea". Barbara Eden portrayed "Greta Heinrich" who is in love with the very serious Jacob. Pal incorporated three tales from the Brother's Fairy Tales. 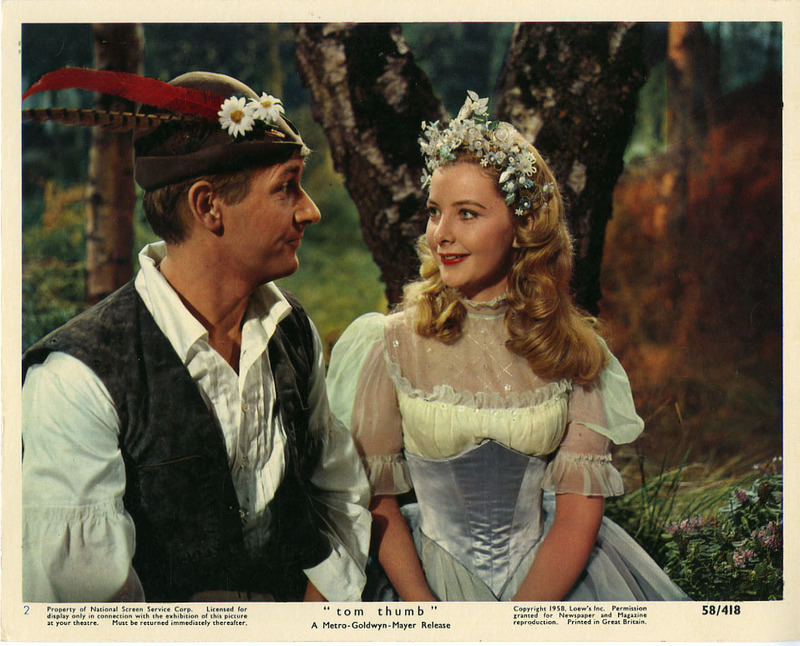 In the first starring from his "Time Machine" Yvette Mimieux in the title role of "The Dancing Princess". Russ Tamblyn played "The Woodman" who is in love with her and later in the picture recreated his role of "Tom Thumb" in a dream sequence. 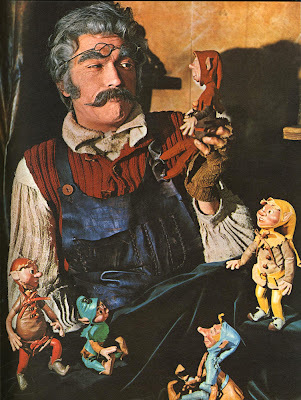 "The Cobbler and the Elves" was the second fairy tale and had Lawrence Harvey as the Cobbler and the "Puppetoons" as the Elves. The third fairy tale kept some of the darkness of the real story. 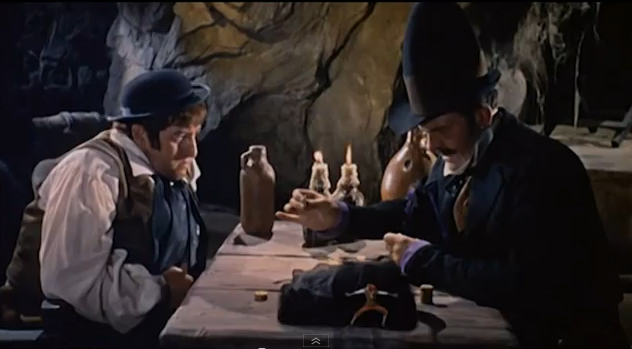 "The Singing Bone" starred Terry-Thomas and Buddy Hackett. 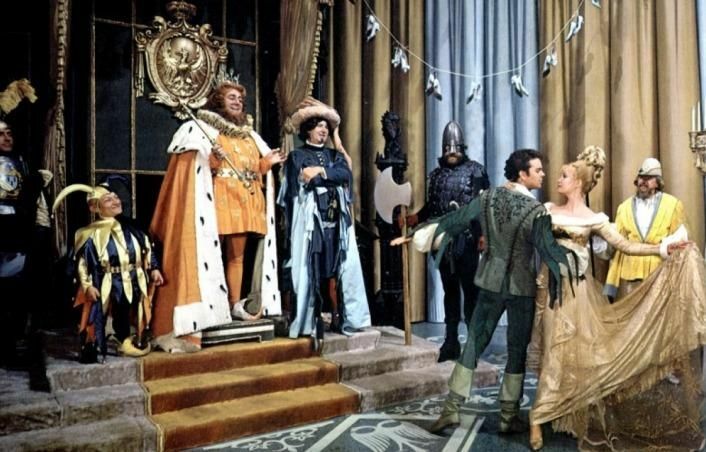 The motion picture was nominated for four Academy Awards and won for Best Costume design. It was one of the highest grossing movies of 1962. 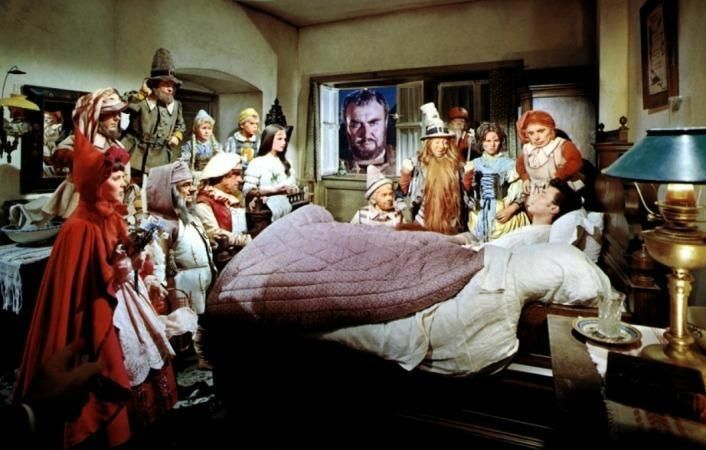 At the climax "Wilheim" becomes very sick and almost dies and in his delirium he sees all the characters that he will create and gives each a name. You can get an idea of those costumes in the still that follows. 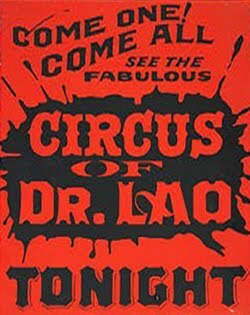 Based upon an excellent 1935 novel “The Circus of Dr. Lao” by Arizona Newspaper Man Charles G. Finney. Who wrote it at his desk waiting for something to report upon in a sleepy Arizona town. 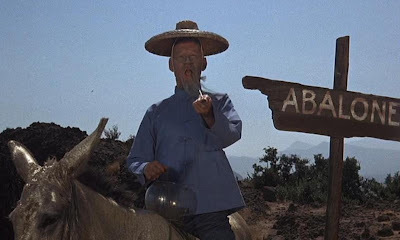 As with Finney's novel this story starts as into the town of Abalone, Arizona comes an old Chinese man on a donkey with a fish in a bowl. He goes to the local newspaper to run an add about "The Circus of Dr. Lao" and then puts up a large circus tent with bleachers, a side show tent and other items. Where these all come from nobody in Abalone knows and to add to the mystery. He claims to be 7,322 years old. The town will never forget his visit as he works magic on the people and their problems. 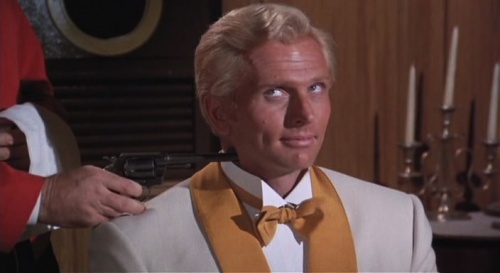 The film version starred Tony Randal and he portrayed five of the seven faces. Although he is given credit for all seven. However, George Pal's son Peter played the Abominable Snowman and "The Great Serpent" was stop motion animated by Jim Danforth. 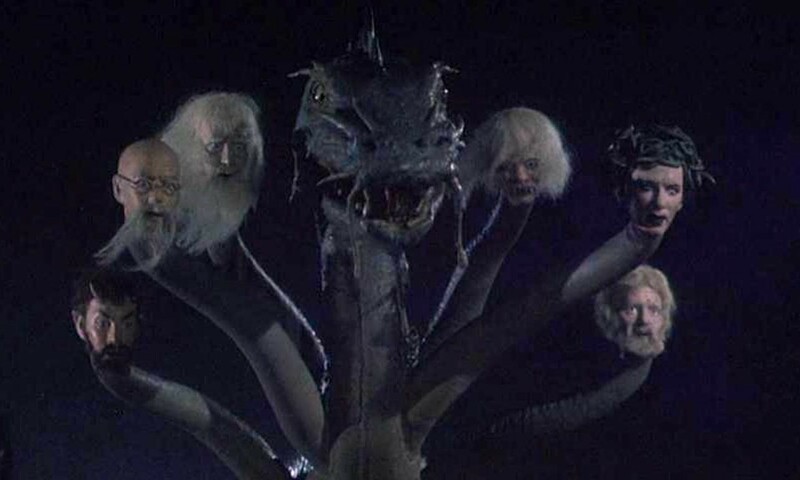 The serpent does have Tony Randall's voice. You could add one more actual face for Randall as he is seen as himself in the circus audience near the films end. The film is a makeup man’s dream and that of an actor portraying the roles as both Oscar Winner for make-up William Tuttle and actor Tony Randall learned. 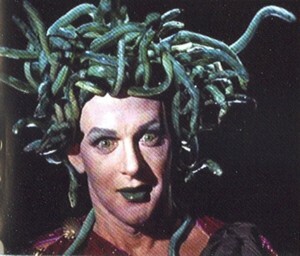 Below Tony Randall as "Medusa"
Tony Randal as himself in the Circus audience center bottom row. 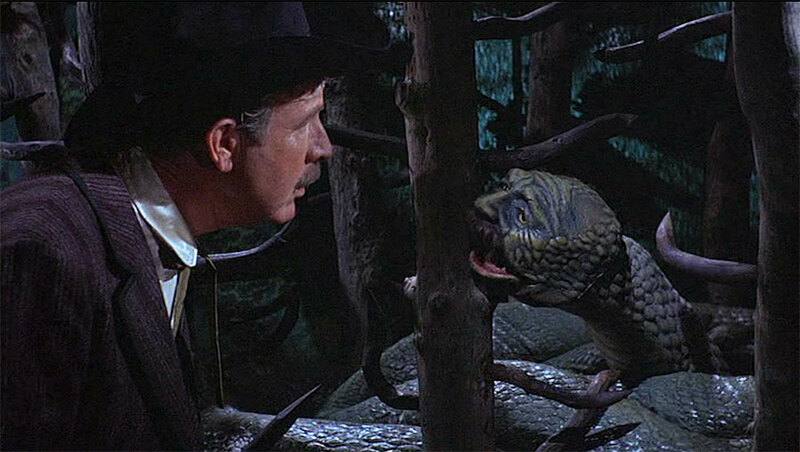 As I mentioned Tony Randal provides the voice for the stop motion "The Great Serpent", but it has the face of the town boss an amazed Arthur O'Connell in this scene. Below Peter Pal as "The Abominable Snowman"
About that fish bowl with it's tiny fish. The sign next to it reads "Loch Ness Monster". It warns not to let it out of the water. The two henchmen of the town boss knock it over and it grows into Nessie. Again Jim Danforth's great work. The motion picture is a classic fantasy and I highly recommend it to any of my readers. I now come to the final two feature length motion pictures made by George Pal. Released February 21, 1968 and directed once again by Byron Haskin was "The Power". Maybe this film didn't have the science fiction/horror of a person's blood vessels popping out on their head, or for that matter their head exploding. However, based upon a novel by Frank M. Robinson and changed slightly by screenplay writer John Gay. This picture covered the same basic territory as David Cronerberg's "Scanners" released 13 years later. As the above poster indicates George Pal put together another very strong cast of actors for the time. For fans of the publication "Famous Monsters of Filmland". 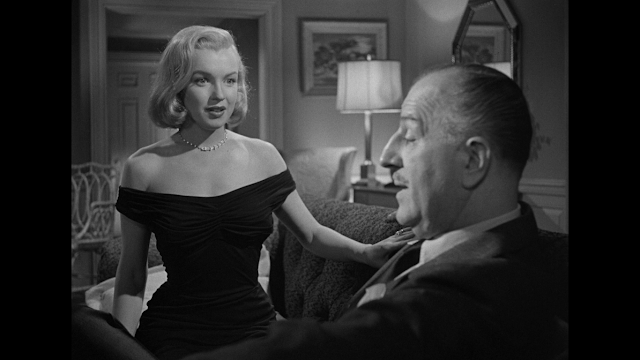 In a cameo appearance as a "Hotel Clerk" was Forest J. Ackerman. 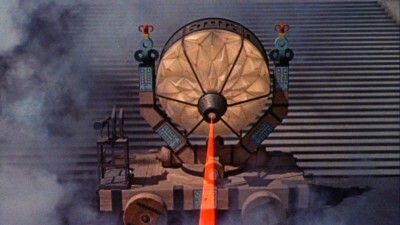 "The Power" is considered the first motion picture to show a telekinesis "PSI Wheel". Which is used to prove that theory. The wheel is normally a pyramid shaped small piece of paper, or foil balanced on the tip of either a toothpick or needle. A person then uses their mind to rotate it without ever touching, or coming close to the "PSI Wheel". A group of scientists at a research facility come under attack by an unknown person named "Adam Hart". Biochemist "Professor Jim Tanner", George Hamilton, believes he's actually one of their own research team. "Hart" starts to kill off the other scientists with "The Power' of his mind. This will lead to the discovery of the killer and literal battle of their minds. Above George Hamilton and Suzanne Pleshette as "Professor Margery Lansing". Many interesting ways are used to kill off the other scientists. One has a centrifuge turned on by the mysterious "Adam Hart's" mind without him physically touching the controls, or apparently anyway near it. The result is the death of "Professor Henry Hallson", Arthur O'Connell. One of the interesting effects in "The Power", as funny as this sounds, was a diabolically possessed "Walk-Don't Run" street crossing sign. The sequence is classic. Another sequence had "Toy Soldiers" coming to life and firing their guns with real gunpowder and bullets. A similar idea would be used twenty-years later for the movie "Small Soldiers". Michael Rennie was "Arthur Nordlund" aka: "Adam Hart". The climax of the film has Hamilton and Rennie in a great battle of minds as "Professor Tanner" discovers also has "The Power". When the picture was released it was the bottom half of a double bill and MGM didn't really promote it. The film is mostly forgotten as a result. It is available on DVD as of this writing. Timing is everything and George Pal's final motion picture was released at the wrong time and didn't find an audience. Also like "The Power", but this time by Warner Brothers, the studio didn't promote it properly. 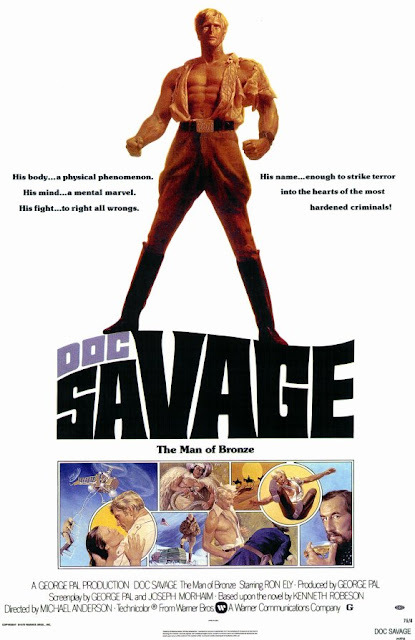 Fans of Lester Dent's 1930 pulp fiction hero "Doc Savage, Man of Bronze", books are still available today, mostly had no knowledge the motion picture was ever made when it was released in June 1975. The film's tone was Chapter Serial Camp and it reproduced the 1930's era very well, but without Warner Brothers publicity department help. "Doc Savage, Man of Bronze" was up against the following motion pictures. The movie that made Steven Spielberg a household name "JAWS", "Funny Lady" the sequel to "Funny Girl" with it's build in Barbara Streisand base. "One Flew Over the Cuckoo's Next" starring Jack Nicholson, "The Rocky Horror Picture Show" and Al Pacino in "Dog Day Afternoon" among other 1975 releases. 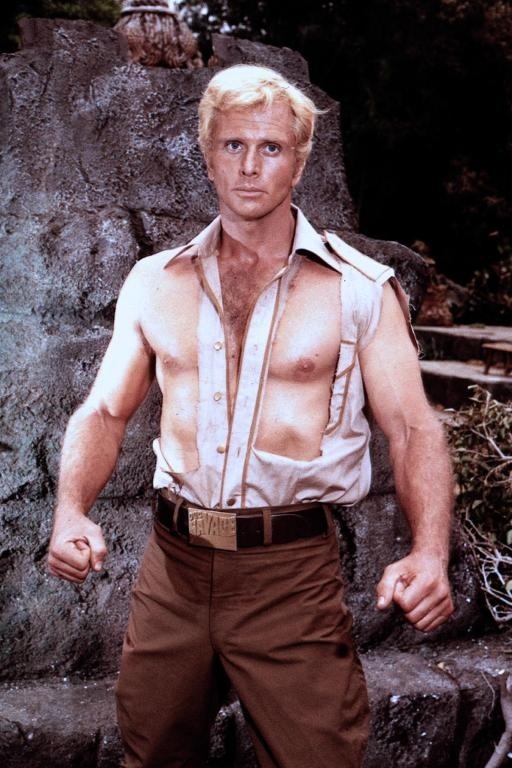 Playing "Clark 'Doc' Savage, Jr" was 1966's television "Tarzan" Ron Ely. The motion picture was extremely faithful to the novels and was based upon the first in the series. One of the elements created by Lester Dent will surprise fans of "Superman". "Doc" had the original "Fortress of Solitude" built in the Arctic. Initially "Superman" built his first "Fortress of Solitude" during what is known as "The Golden Age of Comic Books". The mid-1930's into 1950. However, it was actually called a "Mountain Sanctuary" and was located in the mountains close to Metropolis. It wasn't until "The Silver Age of Comic Books" starting in 1951 that we find "Superman" building his Arctic "Fortress of Solitude" in 1958. The plot has "Doc" and his Team known as "The Fabulous Five". "Major Thomas J. 'Long Tom' Roberts" played by Paul Gleason, "Colonel John 'Renny' Renwick" known for his signature comment "Holy Cow" portrayed by William Lucking, "Lieutenant Colonel Andrew Blodgett 'Monk' Mayfair" played by Michael Miller, "Professor William Harper 'Johnny' Littlejohn" portrayed by Eldon Quick and "Brigadier General Theodore Marley 'Ham' Brooks" played by Darrell Zwerling. The group goes after a Master International Criminal and Smuggler "Captain Seas" portrayed by Paul Wexler. 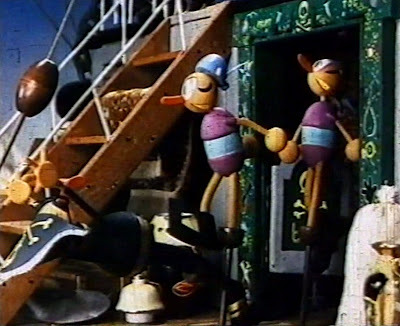 Below "Doc" and "Captain Seas". The plot involves a Mayan Tribe, Quetzamal, that disappeared 500 years before the story, and of course a fortune in Gold. Add in the beautiful "Mona Flores", Pamela Hensley, and you have a fun romp that as I said very quickly became forgotten and overlooked. Six years later, in 1981, the public was ready for this type of motion picture and Steven Spielberg was back with George Lucas bringing them Harrison Ford in "Raiders of the Lost Ark". Another 15 years and the public again wasn't interested in the type of film George Pal had created in 1975. Billy Zane was 1996's "The Phantom" another camp style motion picture and another box office failure, but unlike "Doc Savage, Man of Bronze" the movie has developed a cult following. For those of my readers interested in "Doc Savage, Man of Bronze". It is now available in both DVD and Blu-ray formats. 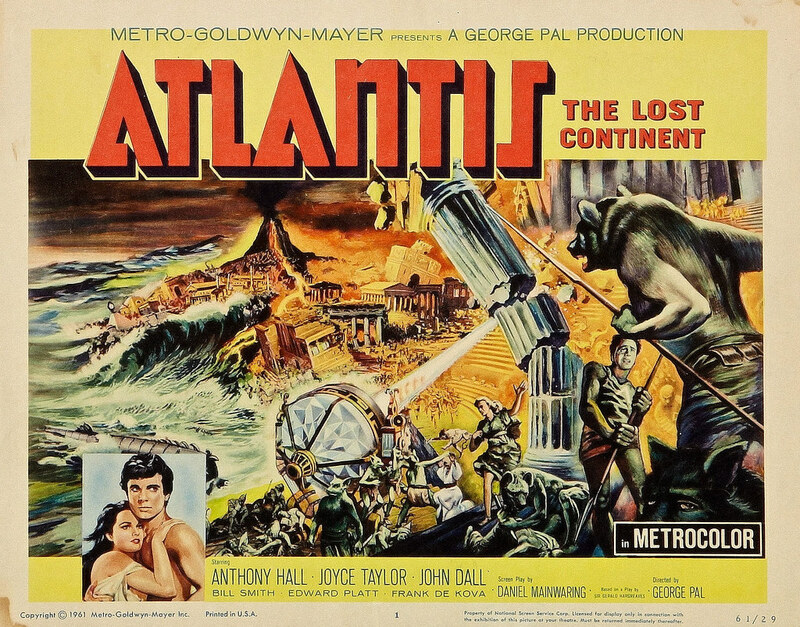 So I end my memories about George Pal and suggest the true lover of Science Fiction Films take a look at the above mentioned works including the flawed “Conquest of Space" and "Atlantis, the Lost Continent". They are mostly from an age of dreams rather than fact. Remember the first man to circle the Earth, Russian Yuri Gagarin, didn’t do it until April 12, 1961. 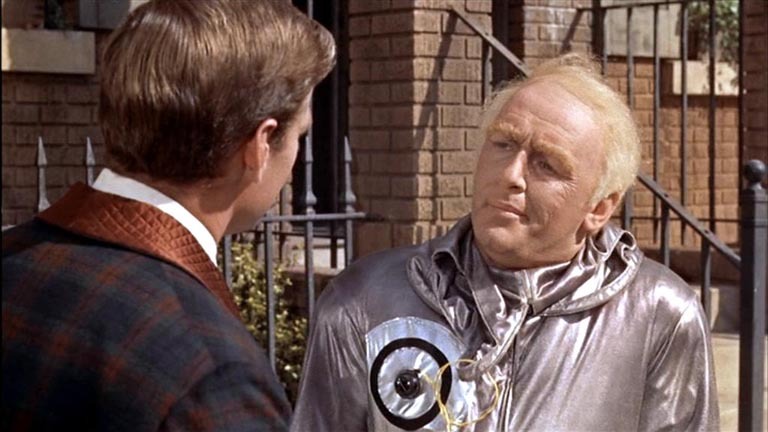 That’s a year after “The Time Machine” was made and 11 years after "Destination Moon".